Berlin, Germany (30th August 2017) – Panasonic is announcing the new firmware update program Ver.2.0 for DC-GH5 to further enhance its performance. 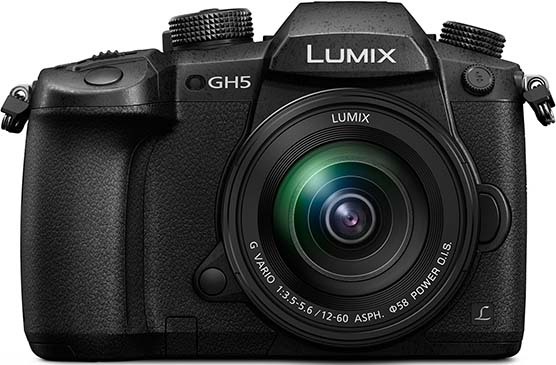 After speaking with prominent photographers and cinematographers worldwide who have used the GH5, Panasonic examined which functions were in-demand by users and therefore what was required from the update. This has led to the enhancement not just being a firmware update, but an exceptional upgrade of camera performance to satisfy professional GH5 users. The new firmware enables GH5 tethered shooting via USB, using “LUMIX Tether” PC software. Users can control the camera by connecting it to a PC via a USB. It lets you view the image on a large PC screen while shooting, which is helpful in commercial photoshoots of portraits, products, etc where continuous confirmation is required. Using [6K PHOTO] or [4K PHOTO] users can start and stop video recording with the tethered shooting. It is also possible to choose the folder to save the image files to the PC. Auto focus [AF] performance is improved for subjects with low contrast in photo shooting. Tracking auto focus performance in video recording is improved. The customised AF area can be continuously displayed in [Multi AF] and [Custom Multi AF] during live-view. The AF area in [Multi AF] can be moved to the other edge (side, top or bottom) when it reaches one edge. The start point of AF lock can be set on the live view screen in advance of [AF Tracking]. The AF area can be moved while the shutter button is half-pressed or while recording in [Burst Mode], [6K PHOTO] and [4K PHOTO]. *Use of Panasonic SD Memory Card with Video Speed Class 90 is recommended for [Loop Rec] of [6K PHOTO]. 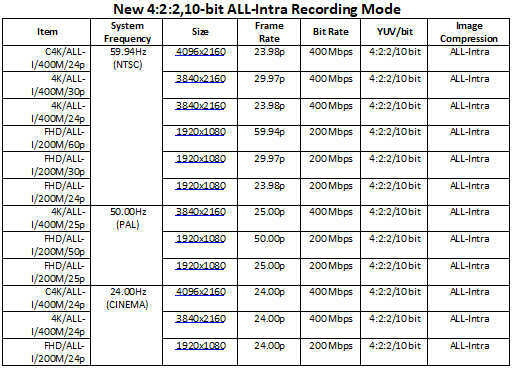 4:2:2,10bit ALL-Intra video recording mode is added to 4K/FHD video recording. *Use of SD Memory Card with Video Speed Class 60 or higher is recommended for 4K ALLIntra video recording. Operation is confirmed with Panasonic SD Memory Card with Video Speed Class 90. [HLG] (Hybrid Log Gamma) is added to [Photo Style]. HDR (High Dynamic Range) is a mode to reproduce both the bright part and dark part in an image, making it appear as the human eye would see. The camera records video with a designated gamma curve compatible with ITU-R BT.2100, and users can now choose Hybrid Log-Gamma (HLG) in [Photo Style]. A low bit-rate recording mode 4K HEVC for HLG has been added. This enables playback on AV equipment compatible with the HEVC compression format, such as Panasonic 4K HDR TVs. High-Resolution Anamorphic mode, which enables video recording in 18-mega effective pixels, is added. [Anamorphic Desqueeze Display] has been added, which lets you view an enlarged image in Cinescope size while recording with 2.0x and 1.33x Anamorphic lenses. [Video Guide Line] has been added to display the image in a variety of aspects, such as Cinescope, 16:9 and 1:1 while recording video. It can be used not only in Anamorphic mode but also in other video recording modes. [I.S. Lock(video)] has been added. This compensates for handshake when the viewing angle is fixed. A new handshake correction mode has been added, which provides optimum correction when using 2.0x and 1.33x Anamorphic lenses. When the K (Kelvin) value was changed after adjusting the colour temperature with 2-axis white balance compensation, the setting was reset. This bug has been fixed. The time to finish shooting and the number of recordable pictures are displayed on the stand-by screen. Power Save LVF can now be used during all stand-by display options. The Bluetooth Remote Control function can be used with Image App, which will also be updated at the same timing with the GH5 firmware release. If the camera has not completed image transmission when it is turned off, it restarts transmission when it is turned on with the [Auto Transfer] function. A rating function using a Fn button is available in Playback Zoom and Multi Playback. The following functions can be assigned to Fn buttons – [Constant Preview] [6K/4K PHOTO Bulk Saving] [Min. Shtr Speed] [RAW Processing] [Rec/Playback Switch] [Destination Slot] and [Mic Level Adj.]. The DISP.Button can be locked. In Relay Rec, there were cases where the video file number was not able to be reset. This bug has been fixed. In Relay Rec, there were cases where the video file number was reset after formatting the SD Memory Card. This bug has been fixed. In Backup Rec, there were cases where the file number did not reset even after applying the resetting function. This bug has been fixed. The image quality when applying the following settings has been improved: Extended low ISO, [i.Dynamic] (Intelligent D-range Control) and Highlight Shadow. • “6K PHOTO” is a high-speed burst shooting function that cuts a still image out of a 4:3 or 3:2 video footage with 18-megapixel (approx. 6000 x 3000 effective pixel count) that the 6K image manages.